Multi-Use Radio Service (MURS) is a short-range, two-way, VHF radio service for free public use. It is not particularly popular, so it is relatively private. MURS range will vary depending on antenna size and placement. With an external antenna, ranges of 10 miles or more can be expected however full line-of-sight propagation is usually not possible due to the relatively low power restriction of 2 watts and even with proper equipment 10 mile ranges are generally not possible. 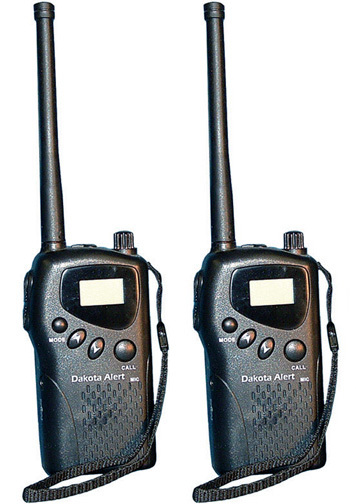 In general use with hand held radios that do not use additional external antennas MURS radios, base stations and motion detectors have typical walkie talkie ranges of about 1-2 miles. If you are going to rely on MURS equipment it should like all equipment be tested on the ground prior to any disaster or emergency use. Channels 1-3 use "narrowband" Frequency Modulation (2.5kHz deviation). Channels 4 and 5 use "wideband" FM (5 kHz deviation). MURS falls under part 95 and is not mandated for narrow banding such as those of part 90 in the public service bands by January 2013. It should also be noted that each of the five frequencies above is actually a range of one to the next listed, this allows for 5 sub frequencies within most MURS equipment. You can think of this as Channel One having 1 and 1.1, 1.2, 1.3, 1.4, and 1.5. While that isn't technically accurate it is an easy way to understand and use the equipment. This is important because while no MURS equipment should be seen as totally private most consumer level users of MURS tend to use it stock out of the box with one of the 5 primary settings. This coupled with the limited range of most MURS equipment makes it far more private then typical GMRS and FRS. No user has priority over another user unless there is an emergency, then you must yield to the person in distress. One of MURS Radio's unique attributes is that it can be used as a security system and force multiplier. This is due to the fact that MURS systems can incorporate motion sensors which are available for up to four "sectors", these being sectors one, two, three and four. The motion sectors can be placed on a property and each will transmit an alert across the frequency it is set to when ever it detects motion. Typically this will be sounded as a voice alert saying something like, "alert sector four". This of course does not limit MURS to only 4 motion sensors, but 4 sectors. Each sector could contain multiple sensors all set to the same alert number. In this way relatively large areas can be covered or in other situations only specific access areas or pathways covered. Coupled with the use of security cameras and an ear piece this is an exceptional force multiplier. This page was last modified on 1 April 2014, at 22:13.